I'm being super lazy with my post tonight. Actually, I was rushing while making dinner and I forgot to write down all the measurements for the recipes. To me the hardest part about updating a blog is documenting all the recipes. I'm so used to adding ingredients to taste (a dash here, a teaspoon there) that I lose track of what I've added. Anyway, everything was delicious and if you want the recipes, just send me an email and I'll be happy to send something to you. Saute red pepper, mushrooms, onions, ginger and garlic in canola oil and sesame oil until soft, about five minutes. In a small bowl mix together cornstarch, water, hoisin sauce, soy sauce and rice wine vinegar. Add sauce to red pepper/mushroom mixture and cook until thickened. Add water chestnuts, baby corn and tofu, stir to combine and heat through. Soak textured soy protein in hot water for about 15 minutes. Drain really well and press with the back of a spoon to drain off additional liquid. You want the TSP to be really dry. Set aside. Heat 1 tbsp canola oil in a large frying pan and add diced mushrooms, Napa cabbage, green onions, garlic and ginger and cook until soft, about 5-7 minutes. Add hoisin sauce, soy sauce, rice wine and sesame oil and cook until all liquid is absorbed. Remove from heat and stir in textured soy protein and stir to combine. Let mixture come to room temperature before stuffing potstickers. Lay round potsticker wrapper on a flat surface and place a small amount of filling (1 tsp) on the bottom half of the wrapper. With your finger rub a small amount of water around the entire edge of the potsticker and fold wrapper into a half moon and seal the edges. Stand the potsticker up, pressing so that bottom flattens slightly and then form five creases around the edges of the wrapper using your thumb and index finger. It's kind of like making a pie crust. I start in the center and make the first crease and then make two creases on each side of the center for a total of five creases. Heat a large saute pan on medium heat and add 1 tbsp of canola oil. Working in three batches add about 6-8 potstickers at a time--you don't want to crowd the pan. Sear potstickers until golden brown about 3-4 minutes. Pour about 1/4 cup vegetable stock over the potstickers, cover with a lid and steam for an additional 2 minutes or until liquid evaporates. Remove potstickers and place on sheet tray, covered with foil and place in the oven to keep warm while you cook the remaining potstickers. Repeat process. Add all ingredients to a bowl and whisk to combine. Serve at room temperature. 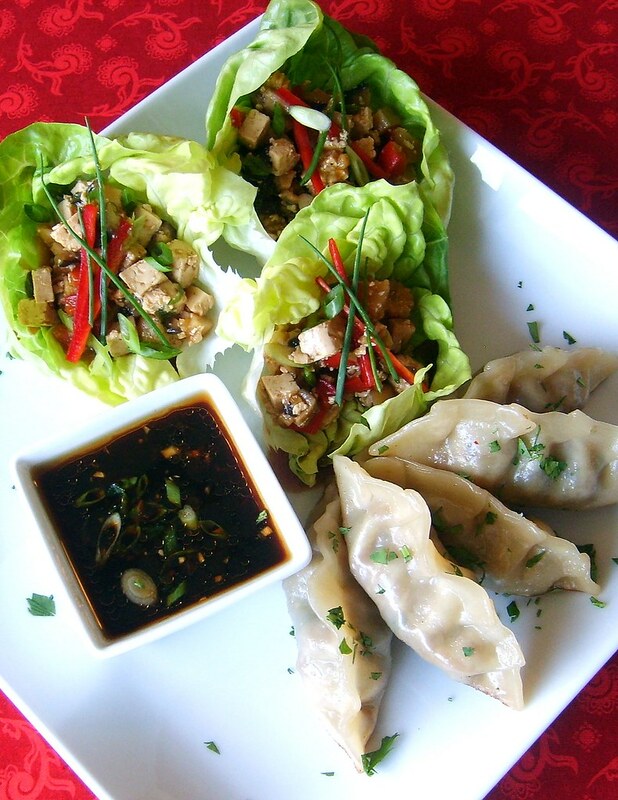 do you have a press that makes your potstickers look so perfect? I'll be posting the recipe later today for this post, but no I just do it by hand. After adding the filling to the potsticker wrapper you stand it up and make your first fold (kind of like creasing a pie crust) in the center and then you make two fold on both sides of center. Flatten the bottom and they you're all set to fry and steam.